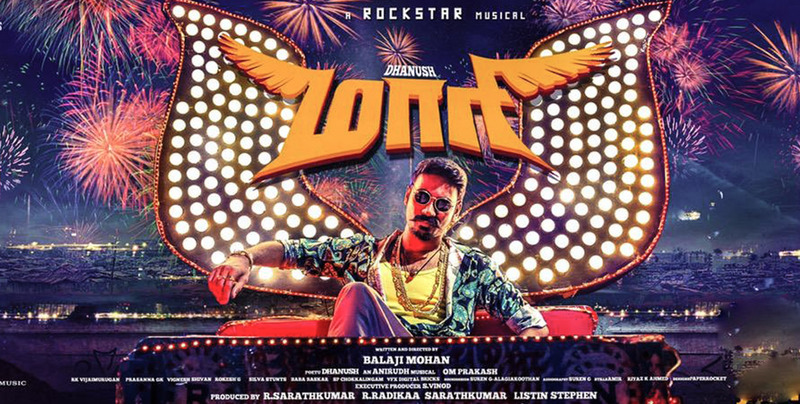 In Maari, the direct introduction scenes of both the male and female lead actors start in the old-fashioned way, develop in the same way, and then end on a sarcastic note, mocking the clichés. Thereafter, every other scene, dialogue, characterization, song-fight sequences fix themselves exactly into the ‘template’ South Indian cinema has been using for so many decades. The scenes from the viral-hit trailer of the film- one that was loved by a good majority of the fans of Tamil cinema, and also the remaining ones who were eventually tamed to love it, thanks to the heaps of remix videos and memes based on the trailer- exhausts almost 80% of its content in the first 10 minutes of the film. Hence, these minutes guarantee maximum entertainment. The ‘Thara Local’ song opens up next erupting the already ‘critical’ audience in a flash. So that is roughly 15 minutes. From there, there is no other full, 15-minute stretch in the film that offers consistent entertainment. Robo Shankar’s comedy is one thing that adds flavor to the otherwise normal scenes in the film- his unique body language, unexpected funny comments with staggering timing that make average scenes noticeable, and the innovative dialogue delivery. The scene when he gathers people for the auto-ride is nothing less than a laugh-riot. Not to forget, almost in none of the scenes, Robo Shankar tries his usual talent of mimicking actors. Minus those mentioned above, there is not much in the 2¼ hours long journey in search of rejoice. There is no clear vision of what the film is exactly about. Is this a film on ‘pigeon racing’, or the intelligent cat-and-mouse play between a shrewd cop and a happy-go-lucky don, or something about the illegal wood smuggling, or the tale of a don trying to have an ‘area’ under control?- and this confusion only makes it a pointless array of scenes. The so called ‘area’ reminds us of the conventional sets in the AVM films of the 1980s- a temple tower, an auto stand, few hawkers encroaching the pavements, and most importantly the shops with colorful plastic pots. Amongst all these template properties the don who ‘dons’ a different getup with exclusively designed moustache, beard, coolers, kilos of jewelry, sporting Hawaiian shirts still ends up monotonous with his mannerisms and dialogue delivery that people have become wearily familiar of. This attribute continues with the film’s screenplay. There are less than a handful of scenes that do not register twists and turns without dialogues or fight sequences. The pointless attitude in visualizing these already clichéd scenes renders the film blunt. You get to encounter the automatically exploding logs of wood (with the quality of graphics of a video game) that help the hero make an ‘astounding’ entry. You also encounter the don suddenly jumping into a pool of press reporters, who cares for nothing and lists out all his plans to his rival, a police officer, outside a police station, and… did you forget the reporters? Never mind, the hero does that too. Technical aspects, story-telling tools, music and so many more things have all perfectly focused on one point- portraying the ‘mass’ of the hero. So does that ‘mass’ actually weigh well? No, there is a dangerous vacuum. 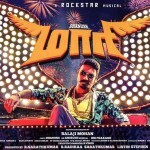 It is Dhanush succeeding in 100% of the scenes. There are a few scenes where the hero faces insult/defeat at the hands of his rivals, only for him to come back with ‘powerful punch dialogues’ nullifying the opposition well before the scene ends. The ‘mass’ on the hero’s side is just too much that it eventually ends up sinking it- the whole film ends up looking like a documentary on Dhanush’s mass image. For example, in the 2012-film “The Dark Knight Rises”, there are scenes that overtly register that ‘Bane’ is physically superior to Batman. A head-to-head battle only goes in favor of Bane. Note- Batman is a superhero. Coming back to ‘Maari’ the film has Dhanush effortlessly beating up Vijay Yesudas, someone who is physically superior, stronger and also a police officer. There is one scene that shows Vijay hitting Dhanush and that one looks blatantly like the ‘mosquito bite scenario’ that Maari eventually mentions. The final fight sequence has Vijay Yesudas not even raising his hand in natural reflex to defend him, waiting for Maari to hit him, like a romantic waiting for his girlfriend to place a peck on his cheeks. There are also a lot of worrying factors in the film. The hero using up every other situation to comment on women’s character is one thing. No, the excessive smoking is not the second. It is rather how and when the smoking occurs- when the hero wins over his rivals, when the hero establishes his power, there is even a scene when the cigarette becomes the ‘hero’. We encounter a cigarette that travels in slow-motion, with heroic music playing in the background, travelling a few meters horizontally in air and hitting a goon- never mind, we have that compulsory watermark at the bottom left corner. For the additional information, a gang of guys enjoying all the above mentioned scenes to the core in the theater, throwing tons of paper in every instant, were identified when the lights were switched on during the interval, to be guys aged between 8 and 13. Those ‘mass’ scenes that are shown every ten minutes, the BGM for those scenes, even the camera angle, the way Dhanush walks away in those scenes shaking his head rhythmically, moments when Dhanush suddenly starts reciting a monologue in a single shot speeding over his actual lip movement, moments when he exactly replicates the ‘Rajinikanth’ expressions, all these resembling exactly the actor’s film “Velaiyilla Pattathari” is something more than just coincidence. The ‘quality’ of screenplay, the visualization and every other thing keeps reminding us of many old films (and Telugu flicks) that we have grown weary of. If you are one who can take it all to sit through the two hours and go on to relish the rare moments amidst the otherwise blunt and not-really-engaging film, this film is for you. It is not a problem when directors like ‘Balaji Mohan try to make masala flicks. The expectation is rather that such filmmakers would make any film doing justice to the medium called ‘cinema’, innovating things in their unique way and avoiding compromise not at least in the trivial areas. Of course, no filmmaker can go on to make only ‘good’ and successful films throughout their career. The popular belief is only that these filmmakers who are known to be the ones contributing to ‘the new wave’ will for the least abstain from making ‘ridiculous’ films.